Thanks for downloading this interesting bmp. It has been months in the making and with the recent addition of the Hellfire missing items and the pre-release demo missing items, ALL versions of diablo are now covered. This picture includes all of the fantastic graphics that were left out of the various releases of diablo. 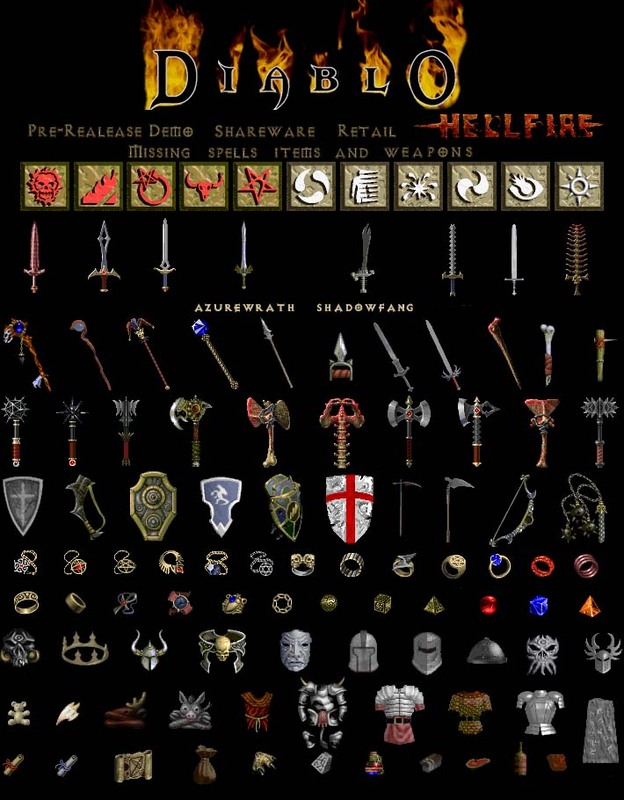 Some of the spells or items may look familiar to veteran Diablo fans out there, such as the hacked Lightforge Helm graphic or the Bloodboil spell from the pre-release Diablo game, which happily makes a reappearance in a different form with the hidden Barbarian character to Sierra's expansion pack Hellfire. The reason i created this bmp is first and foremost because of all the fun i've gotten from Diablo, been playing for over a year now off and on but also because of the growing list of "things" left out of Diablo for one reason or another. Weve all heard the reasons from Blizzard from unbalanced game play to insufficent time to work out all the bugs. The later being primarily the reason for these "things" being left out. There were fantastic quests and characters left out of the subsequent releases including the Fallen Angel Quest Azazel who weilded the heavenly blade Azurewrath. Also the Priest Tremain (who was supposed to give you lightforge a mace upon completion of a certain quest) talked about an unholy blade Shadowfang. Both of the swords graphics i've included, too bad they aren't anywhere to be found in the final release of Diablo. Also for those interested i have not included items (from the pre-release demo that is) that were just transfered to the shareware and retail version and only changed slightly (like books,helms, potions,etc.) but the real interesting ones like the rune mask etc. I have also included the missing items from Helllfire the offical expansion pack to Diablo. Yes there are many items missing from the expansion pack itself! However as of this writing 1-16-98 there may be some rings that appear in this graphics complilation that have not yet been found. New uniques are sometimes hard to find in Hellfire ;) (Also for those you are saying "what about the picture on the back of the Hellfire box?" well the picture IS incorrect . Sierra has stated "their artists got a little carried away" so not all of those items appear in the game nor are they hidden on the cd, they were never created except by the artists. I now believe i have shown all of the missing items and spells in Diablo all versions. These graphics really are INCREDIBLE and the folks at Blizzard and Sierra really deserve some more applause for there great game, just wish they would of included these missing items or not allowed us to find them, in this case ignorance really is bliss. and thanks to the 16 year old who made the Diablo archive viewer named (oh i hate to have to say this) "Lucifer"